Different in concept to the other nominations, in that it was a speculative venture comprising a substantial number of varying buildings, Wyndham Place nevertheless still achieved the high standards the judges were looking for. This applied both at the level of individual buildings, and in the character of the new quarter of Tisbury they have created. 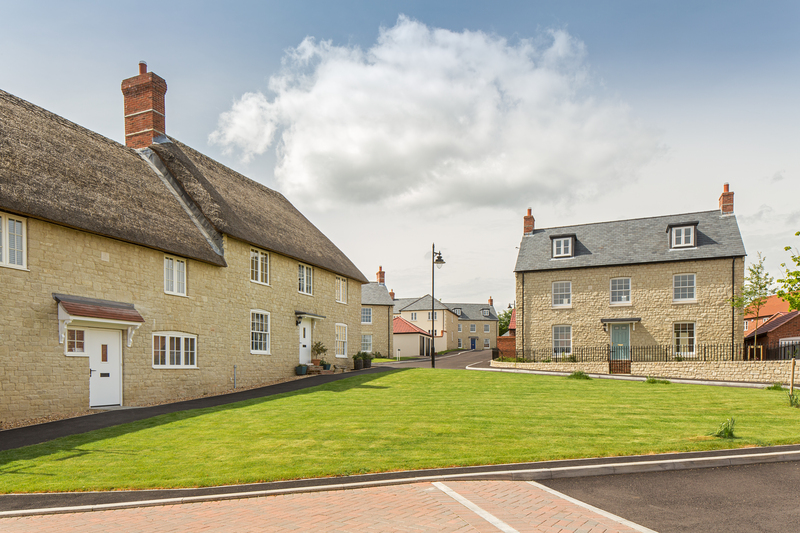 Rather than looking like the average volume housebuilder’s estate, a lot of thought has gone into producing the appearance of organic growth typical of a large village. The total of some 90 houses is made up by a few individual ones, but mostly short terraces, in varying historic styles and with differing orientations based on an intricate street pattern, with communal areas of grass filling in the gaps. Walls are in render, stone and brick, carried out to a high standard, the brickwork in particularly being way ahead of the average speculative estate. Roofs vary between slate, tiles and thatch, with details like porches well thought out, and street furniture well chosen. There are good pedestrian links, and parked cars have not been allowed to dominate the scene. The commercial buildings near the entrance form an effective contrast. The judges were also impressed that they had actually been provided, in accordance with the master plan, something not always guaranteed with mixed use developments. As a lesson to other, larger developers as to what could be achieved if the commitment was there, the estate clearly fully deserved an award.